The collection of four books of Star Trek: New Frontier is a great way to kick off an offshoot series. It starts slowly as the first book is really just collecting the crew members and providing a bit of background for each. Finally, in the second book, readers begin to get the real payoff of the development of the characters in the first and the ride doesn’t let up from there. These read like a single book instead of a collection of four and the adventure is rip-roaring, often stretches the imagination, and is backed by strong characterization. Each book will take you about the time to read it that it would take to watch an episode of the TV show. They move quickly, and each kind of feels like an episode as well, but with (much) more continuity of story than the TV shows demonstrate at points. In other words, it feels exactly like a Star Trek book should read. I quite enjoyed these books (apart from what seemed like a drag in the first one as there was little payoff until the second) and I plan on reading the next ones when I get the chance. I recommend it for fans of the Star Trek universe. I do recommend these books to fans of Trek and would read them again. 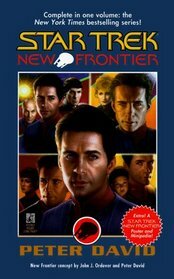 If you enjoy Star Trek, do yourself a favor and start reading the “New Frontier” novels. I can see the family resemblance. We’ve now finished watching all of season 3 of TNG and offered individual reviews of every episode. How about taking some looks at the best and worst parts of the season! Feel free to chime in to let us know what you thought. There are SPOILERS for Season 3 in what follows. J.W. : Alright let’s just admit that Lwaxana Troi (“Menage a Troi“) can take this category any season in which she appears. Instead, I’m going to pick Devinoni Ral from “The Price.” The episode itself was decent, but Ral’s hyper-seduction and assault of Troi (touching without permission, etc.) and overbearing insults toward Riker made it almost unbearable to watch at points. J.W. : Sarek from “Sarek.” Watching a Vulcan suffer breakdowns related to emotions was moving, and Sarek played the part perfectly. It’s also a great tie in to earlier Trek lore. Beth: Sarek is the best guest character. He’s got the most interesting dilemma and the characters around him added interest. Beth: Geordi La Forge between the two episodes he was prominently featured in, his character was developed and his acting talent shown. J.W. : The Klingon assembly turning away from Worf in “Sins of the Father.” You may have thought the episode might end badly for Worf, but I don’t think anyone could have predicted the utter shame he was wrongfully subjected to. It seems like an awesome set up for later plot development. Beth: “I am Locutus of Borg” from “Best of Both Worlds Part I”- it was so epic! J.W. : In “Who Watches the Watchers” we’re taken on an ahistorical ride through the evolution of religions school. It’s rather pointless and also inaccurate. J.W. 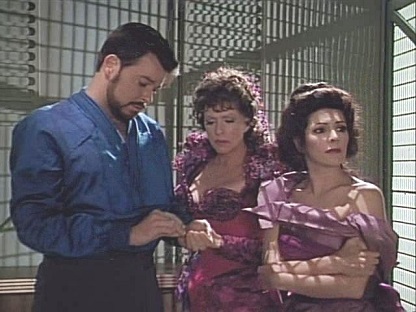 : Easily “Menage a Troi.” Absolutely nothing went right in this episode, and it was just a terrible sight to behold. It might be the worst episode in the series so far (and hopefully overall), though “The Child” gives it a run for its money (as does “Shades of Gray” but that gets a Mulligan). Watching Lwaxana Troi is always a way to spoil an episode, and the plot was just absurd. Approximately 20 seconds of this episode was bearable. J.W. : I had to sit and think this one over for a while, but I’m going to go with “Sins of the Father.” Season 3 was filled with epic moments and persistent storylines, but here we have something that catapults Worf’s family into the limelight in spectacular fashion and sets up what will hopefully be more thrills in the Klingon part of the galaxy. Beth: “Best of Both Worlds Part I” kept you on the edge of your seat and featured some great acting. J.W. : I think this season is just fantastic. Sure, there are bumps along the way but it is consistently good television. I give it an A- overall. There’s still room for improvement, but I was very satisfied with this season. Beth: B+ Despite a few not-so-great episodes the overall quality of the season. Star Trek: The Next Generation Season 2 Awards– Swing on by to take a look at the awards for Season 2. What do you think of the selections? Yep, that’s the spot! Right there! A badly injured man is the lone survivor of a wreck that the Enterprise goes to aid. He has remarkable healing powers and over time he and Dr. Crusher develop a working relationship that perhaps goes beyond that. However, he does not remember his past or what happened to him. His healing powers continue to increase and it turns out that he is actually the next stage in evolution for a local race of humanoids. They try to hunt him down due to fear, but he transcends their existence and ceases the mounting conflict in the process. He departs from the Enterprise as a being of seemingly pure energy. The premise of this episode isn’t terribly original: someone with amnesia is rescued by the Enterprise and a mystery develops around figuring them out. Mysterious powers are another well-worn path for TNG and Star Trek generally. However, the mystery throughout this episode is combined with an interesting element of elapsed time. The episode takes place over some indeterminate period of time which seems to be at least several weeks. This gives “Transfigurations” a feeling of development not just in the character of “John Doe” but also in the characters around him. The side stories in this one don’t seem to add enough to the plot to keep it as compelling as it could be. Geordi’s sudden confidence bestowed by John Doe is tacky, and the developing relationship between Dr. Crusher and John Doe is awkward at best. Despite the unoriginal plot, it is a main story that at least stays interesting as the tension mounts while John Doe starts to remember portions of his past and what happened to him. The revealing of his powers is a pretty cool moment, though it feels a little bit extreme. It’s a decent but unremarkable episode. The Borg have shown up again as a Starfleet colony disappears. A Commander Shelby, an expert in Borg technology, is dispatched to help the Enterprise deal with the threat. 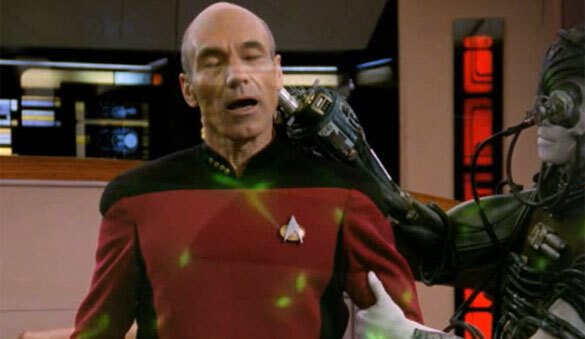 The Borg come for Picard and end up capturing him, assimilating him into the Collective. Meanwhile, the crew of the Enterprise and Shelby must work to try to outwit not just the Borg but Picard. The episode ends on a cliffhanger as Riker decides to open fire on the Borg Cube that has Picard on board. Those words still terrify me. When I was younger it was because the Borg felt so real and I would fear they might come after me some day–I am J.W. of Borg! As an adult, the notion that the untouchable Picard could be corrupted, possibly for good, is a very scary thought. Realistically, we know that he’s not going to be permanently Borg, but it still is a fearsome moment and an awesome cliffhanger ending. What makes the episode more powerful is that one gets the feeling Picard really will be scarred by this even if (when) the crew manages to save him. It simply is not something someone can go through without having deep scarring occur. How might this impact his sense of self going forward? How might we feel in the same situation–manipulated into attacking those we love? The interplay between Shelby and Riker is also interesting, as it gives us time to reflect on how Riker’s character really has matured throughout the series. He continues to turn down his own ship, and the pressure to take on his own command, combined with a mirror image of his younger self in Commander Shelby, makes for a fine subplot to carry into the next season. The plot is interesting, and the Borg have been carefully crafted into perhaps the most malicious threat in the Star Trek universe. Great way to end the season, unlike some seasons (here’s looking at you Shades of Gray). Deanna is also unimpressed by this episode. Renowned ambassador Sarek–Spock’s father–is dispatched to the Enterprise to start of negotiations with a notoriously difficult species. The moment he boards, however, it seems things are wrong. Emotions run high aboard the ship and even Sarek appears to be hampered by emotions. As the crew investigates, it turns out that these may be coming from Sarek because of a rare disease. The only way to continue negotiations is to have Picard take on the burden of Sarek’s boiling emotions, which he does. The negotiations are successful and both Picard and Sarek are changed by the event. Patrick Stewart. Patrick Stewart. Patrick Stewart. What an amazing actor. The scene in this episode in which he is taking all the pain and emotion from Sarek must go down as one of the greatest scenes in television history. I mean that seriously. The acting by Stewart sells a scene that could have been silly and makes it into an awesomely emotional and stirring moment. The episode starts off very slowly. Sarek shows up, there appears to be something ailing him. The crew experiences increasing tension. The connection is made. It’s not much of a mystery. We can see the clear link between Sarek and the anger long before any of the main characters have, but the payoff we get from this episode is all about how Picard is able to step in and take on a situation which could destroy him. It’s moving in a way that few TV episodes manage to be. I wish we’d been able to see whatever species it was that wanted to sit in the weird pool in the darkness, but again that’s not what this episode is about. It’s all about getting we, the viewers, to see Picard handle an emotional roller coaster. It’s that moment which sells this episode. Everything else is fluff. That could be a bad thing, but in “Sarek” you won’t mind. It’s just that good. A conference is being held on Betazed and the Ferengi are among the invited species. One Ferengi, Damon Tog, is infatuated with Lwaxana Troi and the monetary prospects of having her as a mate. He kidnaps Lwaxana and Deanna Troi along with Riker. As these three try to manipulate the situation, they are thwarted. Ultimately, Lwaxana volunteers to stay behind but is saved by a clever false love spat between herself and Picard. What can I say? So much goes wrong in “Menage A Troi” (the title, for one) that it is hard to pick a place to begin. First, it forced me to type the line “infatuated with Lwaxana Troi” which is a phrase that must never be uttered. Second, oh my goodness what a paper-thin plot. I get it in a way: it is supposed to be a way to feature a set piece of the Troi family’s interacting with Riker and kind of a get to know everybody moment. Riker gets a chance to prove himself, right? Well, no, not really. That may have been the intent but the product is quite different as Lwaxana is split from the other two upon the kidnapping and then is forced to carry her own part of the episode. Let me tell you this: if Lwaxana Troi has to carry an episode in any part, that episode will be awful. Honestly, the actress does a decent job, assuming her job is to be an insufferable character. The problem is that Lwaxana is utterly insufferable on any conceivable level. But even the parts of the episode that don’t have Lwaxana in them are pretty bad. The Enterprise is dispatched on some random mission that keeps them from helping. Riker and Deanna have barely any time to try to salvage what’s left of the episode, and the whole thing just feels totally forced. 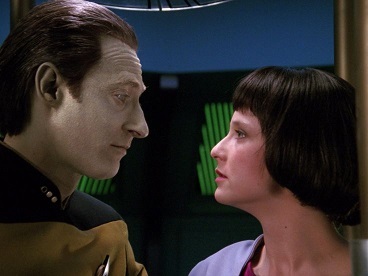 There is one scene which isn’t atrocious: Picard forced to pretend he likes Lwaxana and reciting love poetry to her. It is a really funny sequence, but after being force-fed garbage for so long, it hardly makes an impact. I should also note (here I am trying to not some positives, look how good I am at this!) that the set for Betazed was decent. The Ferengi ship having random beds and torture devices was weird but at least made the ship seem clearly different from other ship sets. Oh, and I suppose that Star Trek Chess has always been cool. Does it seem like I’m grasping at straws here? I am. This is an irredeemably bad episode. Side note: I think this is the new biggest spread in the score between my wife and myself.